A man whose right-hand side was paralysed when he was stabbed in the head with a screwdriver is taking part in a triathlon for charity. Nick Verron, 31, suffered an unprovoked attack in Bournemouth in 2009 and was "unable to walk, talk or swallow". 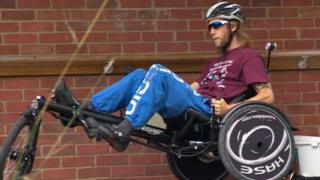 He is taking part in the Para Tri at Dorney Lake, Windsor, with two of his physiotherapists. He now lives in Aylesbury and is raising money for the UK Acquired Brain Injury Forum. Mr Verron, who was 25 at the time of the attack, is completing 12.4 miles (20km) on a trike. Two of his physiotherapists from the Royal Buckinghamshire Hospital are doing the swimming and running sections. He said: "Doing this is beyond my wildest dreams, I could never have envisioned that this is where I would be in my life to this point. "After I was attacked, I couldn't do even basic things like swallow water or walk or talk, I was paralysed down one side. "Being able to compete in a sporting event with able-bodied people is incredible." The Para Tri event claims to be the UK's first mass participation disability sport event and is open to disabled or able-bodied people. Mr Verron has already raised almost £1,400 for charity but said he would like to raise more. He said: "It does take it out of me, but it is the smile on my face which gives me unlimited energy. "It is the freedom as well, I have been locked in a prison at home because I physically can't go out. "Having the bike is like being released from prison, it is just such a feeling of liberation."